How to Restrict Apps on iPhone? How to Set Parental Controls on iPhone/iPad? Although WhatsApp messages are encrypted, there are still some ways you can keep an eye on such messages and content remotely. The WhatsApp sniffer tools are particularly useful for parents who want to track their kids' WhatsApp messages and activities. Furthermore, you can also protect your kids from individuals with malicious intent, so these tools are very useful. Bonus: How to Avoid Your WhatsApp from Being Spied? FlexiSPY is one of the best WhatsApp sniffer tools that you can install on your iPhone in order to keep your personal information, your business, and your loved ones safe. This tool allows you to remotely see everything that is happening on an iPhone. FlexiSPY captures all kinds of information coming and going from phone (including WhatsApp content). The tool has many features. Comes with a free iPhone monitoring app. Monitors all kinds of messaging i.e. email, SMS, WhatsApp, Messenger, Skype, Viber, and more. Spyzie is another popular WhatsApp spy tool that you can use for WhatsApp sniffing and spying purposes. Spyzie can be used to spy all kinds of iDevices. The demo version of the tool is also available which you can try before making a purchase. Track calls, SMS, GPS, app chats, messages of IM apps such as WhatsApp, Viber, Messenger, etc. No jailbreak required. The tool operates silently in the device via Invisible Mode. Spyzie allows you to monitor all activities remotely. Fully compatible with all iDevices. You cannot download the videos. Video preview also prevents you from watching them later. Causes lags in some iDevices after installation. 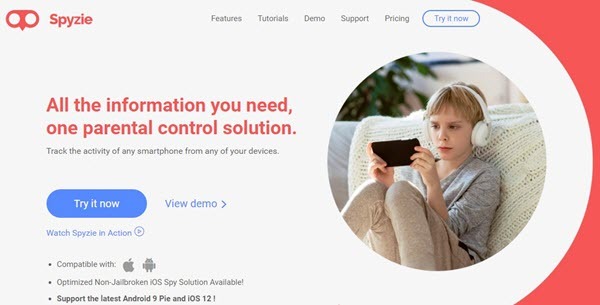 PhoneSheriff is an advanced WhatsApp spying tool that has been specifically designed to help parents monitor their kid's smartphone and tablet activities. This tool allows you to learn about your kid's activities as well as also gives you several options to block certain activities. Monitor internet history, text messages, call history, apps installed, photo logs, contacts, and more. Block apps on the iDevice of your child to prevent them from using them. Wide range of filtering options including website filtering and contacts filtering. PhoneSheriff only works on those Android devices that are rooted. mSpy is a great WhatsApp spy and snipper tool that you can use to monitor WhatsApp messages on both Android and iOS devices. 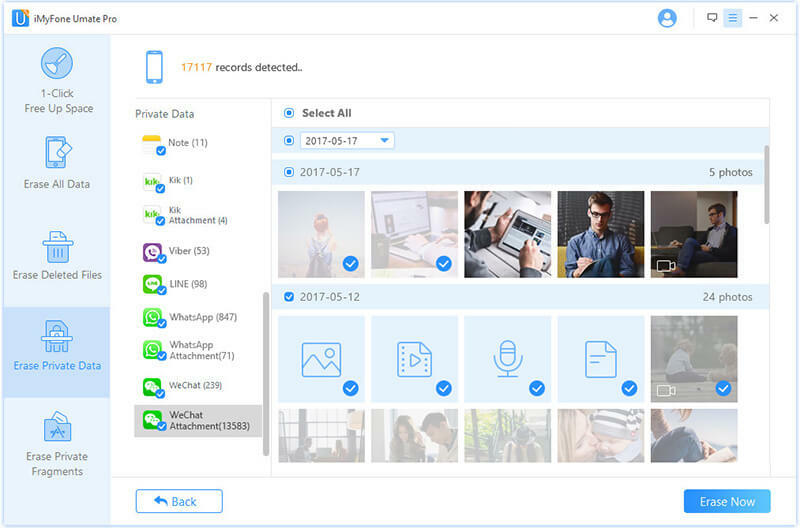 Compatible with both Mac and Windows operating system, mSpy is beautifully designed, easy to use, and has lots of useful features. Realtime monitoring of messages from a variety of apps including WhatsApp, Tinder, Line, Viber, iMessage, Skype, Snapchat, and more. Monitor emails as well as web browser history. View calls and installed apps on the device. mSpy is susceptible to privacy issues for some users. If you want to protect your WhatsApp messages and attachments from being spied. You will need to permanently erase them. iMyFone Umate Pro is a professional tool that will allow you to achieve exactly that. It can permanently erase any kind of data from your iDevice quickly. Data erased via this software cannot be recovered, so you can rest easy knowing that your privacy will be protected. Permanently erase WhatsApp messages as well as attachments (photos, audio messages, videos, etc.) to prevent being spied. 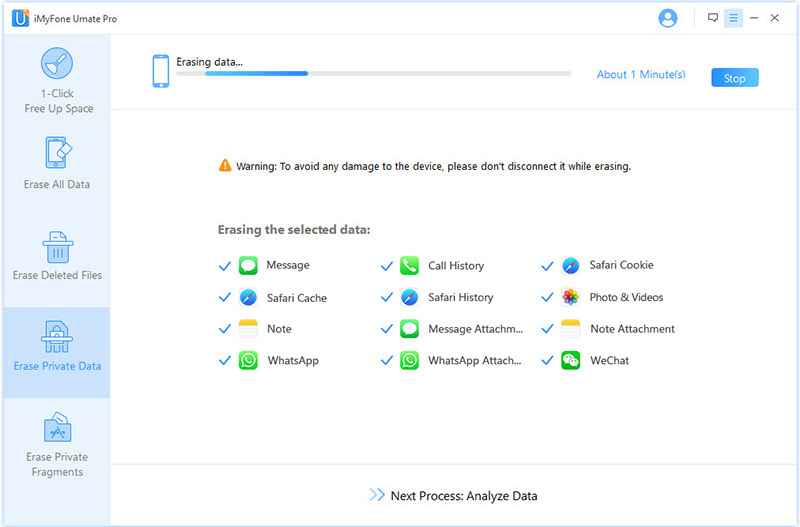 Permanently erase all WhatsApp data fragments such as cookies, app cache, corrupted files, etc. Step 1. Plug your iDevice into your Windows PC or Mac via compatible USB cable. And launch iMyFone Umate Pro. Step 2. 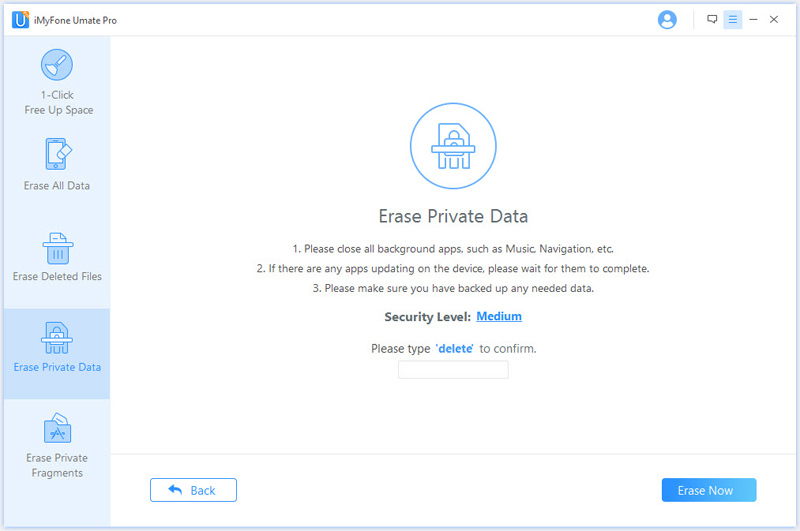 Select Erase Private Data tab from its home interface and click on the Scan button. Step 3. Once the scan is finished, you will see a list of private data stored on your iDevice. Now use WhatsApp and WhatsApp Attachment tabs to browse and select the data that you wish to permanently erase. After selection, click the Erase Now button to proceed. Step 4. Next, choose a deletion Security Level and input 'delete' in the textbox shown on the same screen. Step 5. Now click the Erase Now button to start the deletion process. iMyFone Umate Pro is the most effective solution for securing your privacy as an iOS user. 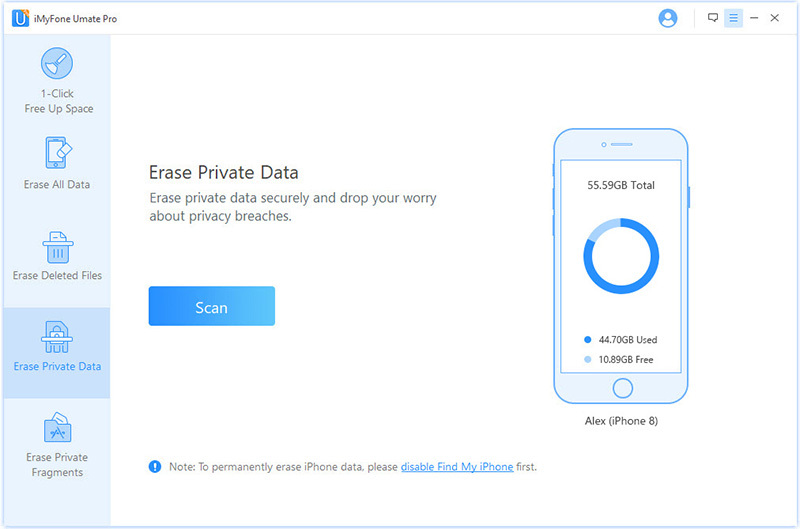 It will help you to protect your identity by preventing possibilities of privacy breach, delete 3rd-party app data that can possibly lead to privacy leak, completely wiping off all iOS data in case you want to give out or sell your phone. Permanently erase all kinds of data such as photos, videos, call logs, contacts, messages, etc. Scan and permanently erase data that you have already deleted to make it 100% unrecoverable. Preview data before deletion to prevent accidental deletion of important files. Boost your iDevice's performance and free up plenty of storage space via 1-Click Free Up Space mode.